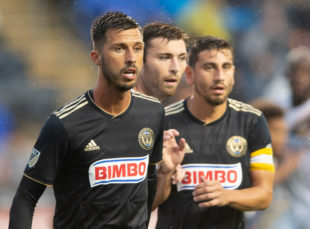 Philadelphia Union’s 2019 season began a few weeks ago with the Monday, Nov. 19 roster announcements and Ernst Tanner’s end-of-season news conference. The next 2019 event will be announcing the club’s F.C. Cincinnati expansion-draft protected-list. It will be made public after MLS Cup Saturday and Sunday’s subsequent half-day trade window. The protected list may telegraph significant information about the club expectations and intentions for its 2019 roster. Here are three speculative possibilities. Were Borek Dockal not to be protected, the Union would telegraph that they have limited expectation of re-signing him, and need both to replace him and to sign a back-up for the replacement. Were Kacper Przybylko protected, they would probably exercise his option going forward and would be less likely to replace him with an outside striker. Of course they easily might add a fourth, given future possibilities of playing with two. Were Haris Medunjanin not protected, Derrick Jones’s role would probably expand noticeably, especially since they seem likely to add a new shape — with three center backs and two strikers — to the predictable 4-2-3-1. In addition to those six protections, the Union have the right-of-first-refusal on three players on Bethlehem’s roster. While there has never been any official public identification of those players, because their current roster lists only three and all are young, promising, prime candidates for poaching, it is a sure bet that Selmir Miscic, Michee Ngalina and Faris are the Bethlehem ROFRs. We do not expect Dockal to return. He wants to return to Europe and is in a strong position to do so. Working out with his old club in Prague seems suggestive. Pryzbylko’s status is uncertain. In observed practices Przybylko has not shown pace sufficient to dominate MLS transition play, although he seems good at hold-up play and distribution. Transition is an overt point of emphasis for sporting director Ernst Tanner in 2019. But playing two strikers suggests stockpiling more than three. Medunjanin is signed for 2019, so protecting him depends whether Alan Koch, F.C. Cincinnati’s coach, would want his combination of offensive pluses and defensive minuses. Koch knows that the best teams in the east neutralize Medunjanin’s strengths and exploit his weaknesses, but that its lesser teams have not done so thus far. Koch had no comparable deep-lying offensive distributor in 2018 in USL, and while Medunjanin is 33 he is also a reasonably priced TAM player. Koch might want him, as Cincy has not yet announced signing any of their USL-era deep-lying central midfielders. The Union should protect these 11. The three below would then be unprotected, so one could be taken by Cincy. Warren Creavalle and John McCarthy are out-of-contract. Tanner has said that Creavalle already has an offer. He says that John McCarthy’s desire to play should be respected. If Cincinnati do not sign 2018’s goal keeper Spencer Richey, who was on loan from Vancouver Whitecaps and has been announced as returning there, they might well sign McCarthy. We are going to protect Fabinho over Haris when Ray Gaddis would be the one who covers Real during the U-20’s. Fabinho may be protected if they want to work him into the coaching staff and want to keep him around this year. Otherwise I tend to agree that we should be protecting someone else on the roster. I’d be ok with our backup 10 being Aaronsen. Isn’t Gaddis out of contract as well? I love and hate this draft. It’s total MLS nonsense and also such a fascinating exercise of personnel poker. Imagine this being a thing in the Premier League! The promoted three teams get their pick of one unprotected first team player and each of the 17 teams already in the league can only protect 11 guys. It would be the most interesting day of the off season by miles. As for the Union, Haris leaving frees up room on the field but might be something Union fans quickly regret; Accam is a dangerous player who, if healthy, would be a great attacking option; CJ just might need a new squad. Agree that a Premiere League Promotion Sweepstakes Draft would be a lot of fun in the abstract. In all seriousness, the MLS expansion draft is pretty ridiculous to me. You have ownership groups that have just paid, what, $150 million to join the 1st division in a sport that has a virtually endless supply of talent and you need to pluck 5 players from the rosters of other clubs? I have no idea how this makes any sense. Totally agree with leaving Sapong and Medujanin unprotected. Not so sure about Accam, though maybe his price tag may scare Cincy away. Obviously Accam had a bad season last year. It’s the possibility of seeing a 2016-17 Accam that gives me pause. I’d rather expose Gaddis or Ilsinho. I think the idea of Accam would be that they wouldn’t select him, given the injury and the money he is owed. It is a gamble for sure, as I would love to see him back next year healthy – to see if he still has anything left. I had big hopes for him coming into the season. I’d be willing to give him another chance and hope he comes back at 100%. Tim’s list only has 1 international available. My guess would be they leave Przybylko available, as the odds he ends up as one of the five players Cincy picks is pretty low. I’d move Sapong to the protected list – not because I think he’s great, but because my choices are to protect Sapong or Accam and I’d rather Cincy take Accam off our hands. I think they have to protect at least 3 of them, but they can protect more if they want. That’s not how the rule reads, at least to me. That said, looking at it again, I can sort-of see that interpretation. I think Im with A on this one. Also I’d rather have Accam, then Sapong. I’d also rather have Accam than Sapong on my roster. I’m playing a guessing game that his salary plus his production last year would be enough to keep Cincy from taking him. John is absolutely correct that I forgot that dimension. Mea Culpa. That being said, the legalistically precise definition MLS uses for international matters because both Haris Medunjanin and David Accam have appeared for their respective national teams in the past, Bosnia-Herzegovina and Ghana. Time to wheel and deal…. Season will be won or lost depending on who Doakals replacement is…..I say give up Accam. Pay for a portion of his salary to if they have to. I think he was a waste of a signing. Make a deal with Cincinati to fill another need from someone they aquire in the draft.. A better left back, a back up attacking CM back one who is better then what we currently have. It should be obvious to all that we need to go out on the open market and get a replacement for Doakal or the Union are screwed and regress to a team somewhat like the year after Barnetta left. Lets be proactive now.